Researchers have developed a multi-layered ‘sensing skin’ to detect corrosive or otherwise harmful substances in structures. Developed at North Carolina State University (NC State), the skin can also detect cracks and other structural flaws that are otherwise invisible to the naked eye. “We’ve created a skin that can be applied to the surface of almost any structure and be used to monitor the structure’s integrity remotely and in real time, identifying potential problems long before they become catastrophic,” said Mohammad Pour-Ghaz, an assistant professor of civil, construction and environmental engineering at NC State and co-author of a paper describing the work. According to NC State, the sensing skin consists of three layers, which can be painted onto the surface of a structure or pre-assembled and attached to the surface. The first layer is electrically conductive and is used to detect cracks. The second layer serves as a buffer between the first and third layers. The third layer detects cracks, but is also engineered to detect specific chemicals of interest. This third layer is said to incorporate metal nanoparticles whose conductivity changes in the presence of specific ions. By changing the composition of the metal nanoparticles, this layer can be engineered to respond to any particular chemical. Electrodes are applied around the perimeter of a structure. The sensing skin is then applied to the structure, over the electrodes. A computer program then runs a small current between two of the electrodes at a time, cycling through a number of possible electrode combinations. When the current runs between two electrodes, a computer monitors and records the electrical potential at all of the electrodes on the structure for both the first and third layers of the sensing skin. This data is then used to calculate the sensing skin’s spatially distributed electrical conductivity on both layers. The researchers have developed a suite of algorithms that can use changes in conductivity measured by the first and third layers of the skin to detect and locate damage and the presence of target chemicals. In a proof-of-concept study, the researchers applied their sensing skin to reinforced concrete. The researchers exposed the concrete to corrosive elements and subjected the concrete to strain in order to simulate the failure of real-world structures. For this study, the third layer of the sensing skin was engineered to detect chlorides, which can cause corrosion in reinforced concrete. 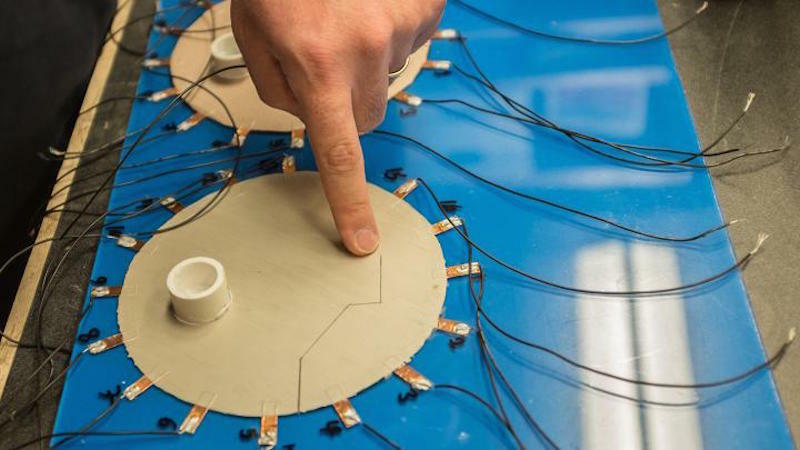 The researchers are reportedly in the process of conducting experiments of the sensing skin on a large-scale structure, more accurately reflecting the size of real-world structures. The paper, A Functionally Layered Sensing Skin for Detection of Corrosive Elements and Cracking, is published online in Structural Health Monitoring.